"Speaking Up for Women and Ethnic Minorities"
Fair and equal treatment of women and ethnic minorities is too frequently unrealised in Hong Kong, but work by Associate Professor Puja Kapai Paryani in the Faculty of Law is helping to shed light on some of the ways in which society can redress the balance. Since 2012, Ms Paryani has compiled strong evidence on the extent of discrimination, unconscious bias and unfair practices in Hong Kong, which she has presented to the government and international organisations. She has also conducted training sessions for non-governmental organisations, corporations and the Equal Opportunities Commission on these issues, and brought together a wide range of stakeholders for roundtable discussions on the plight of domestic workers, ethnic minority children and the victims of sexual violence. These efforts have produced tangible improvements, such as a pledge by the government to officially disband the designated schools policy, improve school admission policies, and provide additional resources for Chinese language education for ethnic minorities after Ms Paryani’s research showed they were marginalised in education at every stage and effectively segregated from ethnic Chinese students in public schools; and a decision by the Department of Justice to install screens in court from behind which victims of sexual violence can testify, following lobbying by Ms Paryani and RainLily, a centre for victims. 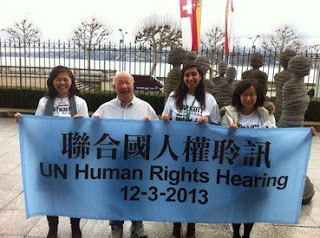 Her oral submissions contributed to the remarks made in the Concluding Observations, issued by the United Nations’ Human Rights Committee and Committee on the Rights of the Child in 2013 on Hong Kong’s international human rights obligations. “People talk about gender-based discrimination or violence, or racial discrimination, but what my work highlights is that people are more than just a single identity holder. We inhabit multiple identities and when you locate and recognise the multifaceted identities all together in one person, that creates distinct vulnerability and disadvantage, which needs to be understood. We cannot develop effective laws or policies unless we can understand the populations we serve. I want to raise awareness about this across the societal, professional, governmental and non-governmental sectors,” she said. Ms Paryani has also encouraged sensitivity training for social workers, NGOs, healthcare workers and the police so they can deal more sensitively with situations involving ethnic minorities and women – for instance, by highlighting the importance of making use of translation services, which are often bypassed to save time. She also played an instrumental role in helping HKU identify more gender-friendly policies in her work as Chair of the Equal Opportunity Unit’s Working Group on Race, Family Status and Gender Identity. “I’m gratified that there has been a change in culture,” she said. “The government moved from saying there was no race discrimination problem in Hong Kong, to allocating resources to remedy what they now acknowledge as unacceptable patterns of racial marginalisation. NGOs are also now inspired to do their own research in this neglected area, monitor policies and call on the government to do better.” Click here to read the full text.